If you’re looking for a large and secure storage unit, this Palram 6ft x 10ft Green Skylight Plastic Shed is just the ticket. Made from lightweight, UV protected polycarbonate panels and reinforced by robust aluminium framing for additional strength. UV treatment prevent the panels from discolouring and cracking, so you can be confident that this storage shed will look great for years to come. Ideal for those looking for a maintenance free shed, this storage unit is supplied with a ten year manufacturer’s guarantee. Aluminium framed double doors provide easy access to the shed and a pad-bolt is supplied for security. With a large, spacious interior, this plastic storage shed is ideal for housing all your gardening tools, equipment, outdoor furniture and bicycles. For extra strength and security, this plastic shed can be bolted down to a solid, concrete base. An anti-slip floor is included to allow for save use whilst storing and retrieving items. 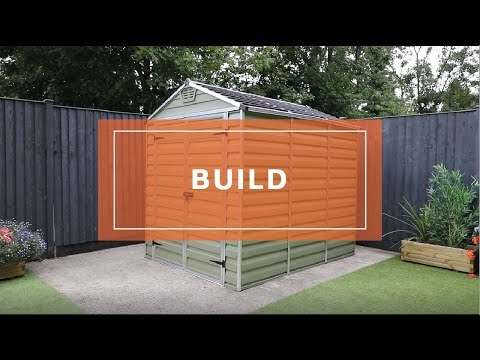 This shed features an innovative slide and lock paneling system for a straightforward installation and is supplied with step-by-step instructions. A unique skylight roof allows natural light into the garden shed, while remaining an opaque exterior, keeping your items safe and out of sight. Integrated air vents allow air to circulate, preventing the build-up of condensation to protect your belongings from potential damage. Review:The shed is a better colour than we anticipated. It went up very easily. Thank you for leaving your feedback today. It is good to know that you are pleased with your product and its colour. Review:Damaged. Its from Palram, all the plastic sheds online are. Instructions were very very poor and should be read forwards then backwards before starting or you will damage the product. Mine was already damaged in 3 places out of the box. Our Reply:Good afternoonI am sorry that your product arrived damaged and wonder if you had called us to enable us to see if we could rectify the problem. Our number is 0800 029 1000.
Review:Received at the time specified. Glad to hear your delivery of your plastic shed went ahead as planned. Review:Poor. Flimsy plastic sheeting. Very thin floor. As mentioned previously, I am sorry to read of your disappointment. A stated, we do provide videos for many products which clearly show their structure prior to purchasing. 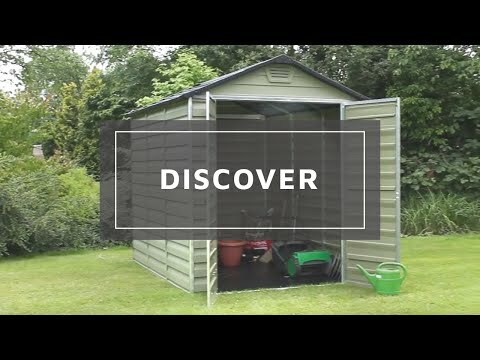 Review:Really pleased with this shed lots of room took longer than we thought to put it up but it looks lovely in our garden. Much better than the old wooden one. I am very glad that you are happy with the quality and appearance of your plastic shed and I thank you again for your feedback. Review:I am impressed by the shed and its appearance and that it does not require ongoing maintenance. It is wonderful that you are so pleased with both the quality and appearance of your plastic shed and I thank you again for your positive review - it is much appreciated! Review:Material is very thin plastic panels and not what I expected the picture was deceptive as looked thicker plastic advisable to go and see one before purchasing. Also needs x6 people to erect not 2 people as they suggested. It is great that you are happy with your plastic shed and the great service and fast delivery. Thank you again for your feedback. I am glad you are happy with the quick delivery service provided and I am sorry to hear that the plastic shed was not as expected. I can confirm that the collected building has been received into our warehouse and your refund has been processed. Review:Disappointed initially as the shed appears very flimsy. But we will assess how effective it is compared to a wooden one as time goes on. Review:The shed looks attractive once erected. The roof lets in natural light. I paid for the shed to be erected and it took one man 3hrs. I am so pleased that you are happy with your plastic shed and thank you again for your review! Review:Ordering was easy and straight forward. Delivery was super quick and the delivery driver was polite and helpful. It took my husband and eldest soon approx 6 hrs to put together - in the main the instructions were easy to follow. Review:Don't put up on a windy /breezy day. Nice shed once erected, looks great. Our Reply:Thank you very much for your kind review, I hope you enjoy your new building for many years to come. Review:Refund given without hesitation. The product didn't meet my needs so I returned it. I would recommend this company. I will use them again. Our Reply:Please accept my apologies that the plastic shed did not meet your needs but I am glad we were able to offer a swift resolution that meant you were still happy with the service received and you would still use Waltons again in future. Thank you again for your honest review. Review:Straightforward to assemble no issues 6 hours for two people with base already done would definitely recommend. Our Reply:We are glad to know that you found the assembly straightforward. Our Reply:I am glad you are very pleased with your plastic shed and that although assembly was a little longer than anticipated, all went okay. Review:Took two of us 5 hours to put it up completely. I found the floor to be quite flimsy and with continued use on a concrete base I can see it cracking fairly soon. Our Reply:I am pleased that assembly went well and must advise that we sell hundreds of these items and the floors are fit for purpose. However, if you have any concerns at any point, please contact us on 01636 880514. We appreciate your feedback. Review:Delivered in two heavy boxes. Instructions quite clear, and nearly everything numbered. Once we worked out how the first few pieces went together it wasn't too difficult...not easy! !...just not too difficult. Very sturdy, spacious and love the way the roof let's the light in. Our Reply:I am glad that the instructions were clear and it was not too difficult to assemble. Great to know that you are happy with the quality and design and we thank you for your feedback!